Not Just Dew Control! Power Management and Cord Management Too! Kendrick delivers power for your other devices where it's needed with fewer cords. 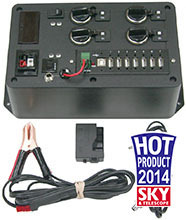 Our new DigiFire Controllers handle 15 Amps of power and with 2 DC Accessory Ports, it can power other equipment too! We have 3 models of Dew Controllers with built-in 8V DSLR Power Supply… Micro-D, DigiFire FX and DigiFire FX-PRO. Just add our DSLR Battery Adapter and power your Canon or Nikon DSLR from the controller. Add our 12V USB Hub to reduce the number of wires even more. Why a 12V Hub? Because you already have 12V up there! We even add a small heater to keep the Hub dry inside. It can even be powered from your DigiFire Controller! Our new LINX Panel is small, lightweight and gives you 6 places to plug in your power hungry devices. This panel is designed to mount atop your telescope! Nikon EP-5A Battery Adapters now available for Nikon D3100, D3200, D5100, D5200, D5300, Coolpix P7000, P7100 & P7700 & P7800 - NOW IN STOCK! Canon DR-18 Battery Adapters now available for Canon 750D, 760D, 77D, Rebel T6i, T6s, T7i - NOW IN STOCK! The new USB 3.0 Hubs have arrived! Now In Stock! Order yours today! Why use a USB Hub? There are an impressive number of USB devices: imaging camera, guide camera, focuser, filter wheel, adaptive optics, flats panel, etc. Each has its own USB cable and by using a USB Hub up on the telescope, you have only 1 cord that needs to come down from the mount. Why a Powered Hub? Unpowered hubs just don't work. Even if you are lucky and have a mount with built-in USB, chances are, it's not powered. Without a powered hub, your computer becomes the power source and the computer is always quite a distance away. Power and signal (data) just doesn't have a fighting chance through those long cables. Why 12V? Because 12V is what you use to power almost all of your devices! CCD Camera, Dew Controller, Focus Motor, etc. In most cases, a 12V power source is already up on the telescope. 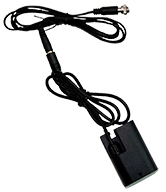 This eliminates 1 more cord that can get snagged when the mount slews. 12V Power Sources? You can power the Hub with your DigiFire 8/12 Controller OR a Power Panel. Placing thoses devices ON THE TELESCOPE means that you can eliminate 1 more cord that won't need to come down from the telescope. Of course, you can also use the traditional cigarette lighter cord too. Ditch the Cigarette Lighter Plug! At only 5.5" X 3.5" X 1.5" and only 7 ounces, it is small enough in size/weight to mount atop your telescope and delivers up to 30 Amps to your power hungry devices. Also available with a built-in 8V DSLR Power Supply. Just add our DSLR Battery Adapter. Micro-D Controllers - NOW IN STOCK! Newtonian secondary mirror dew control. AND..... the Micro-D will also power your Canon or Nikon DSLR! Just add one of our Camera Battery Adapters. The same small 12V battery now powers your Dew Heateras AND your DSLR Camera. Never worry about short camera battery life again! NEW!! Imaging Power Panels. Now available with Anderson Power Pole connectors! one of the "Hot New Products for 2014"! A compact connector panel to provide a centralized power point for all your imaging equipment and a means for cable management. CCD and DSLR imaging versions available. Built in 12 volt, active 7 port USB hub with internal dew heater, 8 vdc DSLR power supply (depending on model), 4 cigarette lighter sockets, illuminated power switch, volt meter, dust and moisture covers on all ports. Provide power to your mount, CCD or DSLR camera, Motorized Focuser, Dew Control System, Guide scope. Mount it on your telescope or mount and have only two cables coming from the power panel, one to your computer and one to your battery! IN STOCK! Very easy to install. 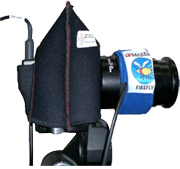 Our New Sun Finder is an excellent product for easy solar finding and centering in your telescope eyepiece. The finder projects a solar dot onto the white target which can be viewed either from the from the front of the finder or through the cut out on the back. Are you a night-time astro or nature photographer? Are you having trouble with dew and frost on your lenses and camera body? We have the solution! An effective anti-dewing solution for exposed Dob and Newtonain mirrors. products, special events and product reviews.